Understanding the many ways in which our teens learn and seek social connections, Temple Emeth offers the Emeth Teen Community (ETC). ETC embraces and instills our core values: promoting Jewish knowledge; fostering Jewish community; and improving our world. One component of the program is “ETC on the Road,” a monthly trip-based program to take advantage of the rich cultural resources and Jewish infrastructure of the greater New York area. 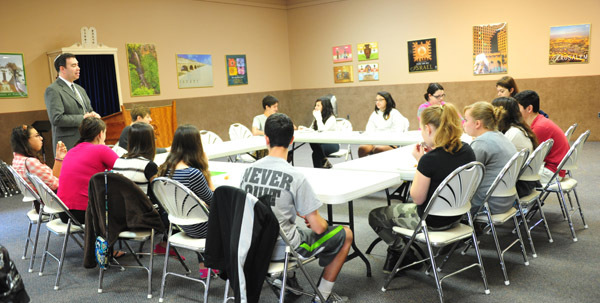 First iCan Israel Advocacy Teen Force Meeting in Paramus. Click here for details of this event, sponsored by the Jewish Federation of Northern New Jersey. ETC Mitzvah Project, where we will plant daffodils in memory of children who died in the Holocaust. How will teens be traveling to their different destinations? ETC on the Road will travel by bus to virtually all of our destinations. Time on the bus enables our teens to socialize and relieves our parents of the responsibility of having to drive carpools. Do I sign up for the entire year, or can I sign up for individual trips? ETC on the Road is designed as a year-long program, during which social connections and Jewish themes are developed and nurtured. For this reason, registration is for the entire year and not for individual trips. Can my Jewish friend who doesn’t go to Temple Emeth join ETC on the Road? ETC on the Road is open to all Jewish teens. If you have a Jewish friend in grades 8-12 who would like to be part of ETC on the Road for the entire year, have their parent or guardian contact Dora Geld Friedman, Religious School Director, at 201-833-8466. What is included in my tuition fee? The tuition fee for ETC on the Road includes transportation and supervision for all trips during the year. (Some of the more expensive destinations may require a supplementary fee.) All participants will receive a T-shirt that students are asked to wear on trips. We will provide snacks, but plan to bring pocket money for trips to the gift shop or meals when advised to do so. How do I register my teen in ETC on the Road? Request an application form by sending an email to Barbara Shater. Are scholarships or financial assistance available for ETC on the Road? We strive to make ETC on the Road accessible to everyone. If you would like to request a reduction in your ETC on the Road tuition, contact Dora Geld Friedman at 201-833-8466. It looks like fun for adults too. Do you need chaperones? Depending on the length of the trip and the size of the group, we will need one or two parent chaperones for each program. If you would like to chaperone, contact Dora Geld Friedman at 201-833-8466. How do I see God’s role in the world? How are my Jewish choices affected by my belief in God? Can I doubt and still be Jewish? Can I rebel and still be Jewish? How can disagreement about God be a force for good? Created by the Reform Movement, Confirmation signifies the acceptance of the confirmands as adult members of the Jewish community. Confirmation at Temple Emeth is held during the evening service of the spring holiday of Shavuot. To be eligible, students must have been enrolled in the Temple Emeth Religious School from at least grade 7 and continue their formal Jewish education through grades 8, 9 and 10. In addition to attending classes, confirmands write an essay which asks them to reflect on a topic of Jewish importance and how it impacts their Jewish identity. The essay selected as best by a panel of judges is awarded the Wilford Weill Memorial Essay Award. The rabbi also meets with the confirmands periodically in order to help them develop a more mature appreciation of Judaism. For more information, contact us at 201-833-8466.